Authors: Daniel Huber, Joshua A. Carter, Mauro Barbieri, et al. Our Solar System is pretty straightforward. Roughly speaking, all the planets orbit in the same plane, most spin on their axes in the same direction in that plane*, and even the Sun rotates in a manner consistent with all this. The small, rocky planets are closer to the Sun, and the big, gaseous planets are farther from the Sun. Simple. Now that we are finding planets orbiting other stars, many are turning out to be multiplanet systems like our own Solar System. However, the first type of exoplanets discovered were solo “hot Jupiters,” so-named because they are gas giants very close to their host star. A typical hot-Jupiter year is less than 10 days long! Surprisingly, stars in many hot-Jupiter systems rotate at a wildly different angle than the planet’s orbit. We typically observe spin misalignment through the Rossiter-McLaughlin effect. This mismatch between a star’s rotation angle and a planet’s orbit angle is called obliquity. Formation Mechanism 1: Dynamical disruptions. Two Jupiter-like planets form farther out, and gravitational interactions kick one out and send the other close in. In this case, we expect to see hot Jupiters with high obliquities. Formation Mechanism 2: Migration. a single planet forms farther out and migrates toward its host star through a protoplanetary disk. In this case, we expect hot-Jupiter inclination angles to line up more like our own Solar System. A good way to test these theories is to measure obliquities in multiplanet systems that aren’t hot Jupiters. If high obliquities are caused by Case 1, then systems without hot Jupiters should have low obliquities. 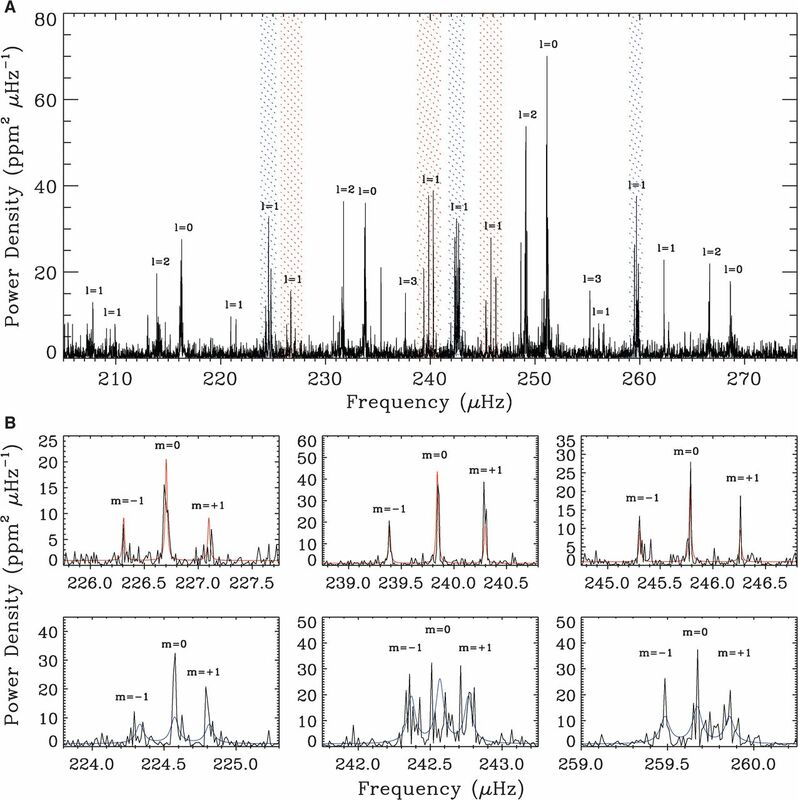 In this paper by Huber et al., they report the first multiplanet system with high obliquity. This discovery means that there must be some way for non-hot-Jupiter planet systems to also have high obliquities. What did Huber et al. find? This system, discovered by the Kepler satellite and called Kepler-56, is an evolved red giant star with two planets racing around once every 10.5 and 21.4 days. The two planets are similar in size to Neptune and Jupiter. While these planets are quite close to their host star, they are not close enough to be classified as hot Jupiters. The authors use an innovative technique called asteroseismology to see the star’s rotation. They use data from the Kepler satellite to measure pulsations inside the star that appear as small changes in brightness over time. Asteroseismology is particularly powerful because it lets us infer properties such as mass and radius from oscillating stars, and in special cases, we can even measure the angle of rotation. To measure the rotation of the star in Kepler-56, the authors looked at oscillation modes due to a combination of pressure and gravity waves inside the star. Certain pressure-dominated and gravity-dominated modes will split in a unique way depending on the inclination of the star’s rotation axis. The authors model the splitting of six modes to derive the star’s inclination. Because the planets transit, their inclination angle is very close to 90 degrees. Therefore, any angle different from 90 degrees for the star’s inclination is a direct measure of obliquity. Measuring rotation with asteroseismology. The top panel is a power spectrum showing oscillations inside the red giant star of Kepler-56. The six bottom panels show zoomed in regions of the highlighted modes above. Each of these is split into three components due to the star’s inclination. Blue modes are pressure-dominated and red modes are gravity-dominated. The solid red and blue lines represent the model fit to all the split modes simultaneously. Radial velocity curve for Kepler-56. The model is the black line, and black points are observations from the Keck telescope. The long-term trend is modeled by the light gray line, while the orbital motion from the two planets are in blue and red. 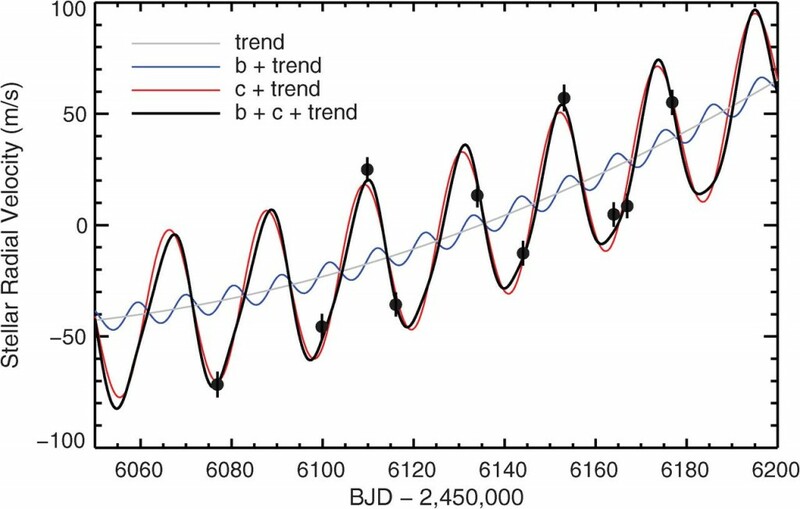 Next, the authors measure how the two planets are tugging on the host star with spectra that show radial velocities. They find something interesting: there is a long-term trend in the radial velocities! This means there is another massive object influencing the system – perhaps a dim star, or another planet. While it’s not possible to fully characterize this “third body” from such a brief set of observations, they can measure the inclination of its orbit. This angle is distinctly different from the star’s rotation and the two planets’ orbits. Strange inclinations. 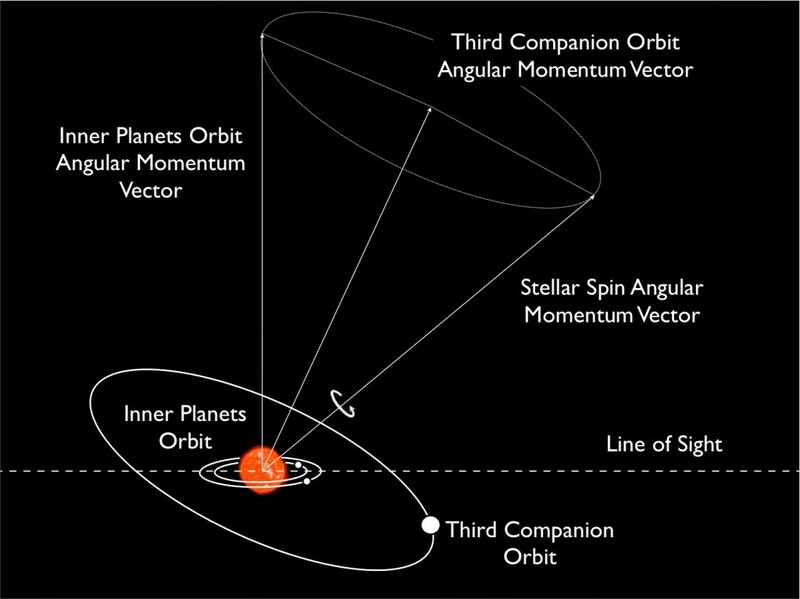 The angular momentum vectors show the axis of rotation for each component of Kepler-56: the star, the transiting planets, and the third body. Every inclination angle in this system is strange! However, the authors point out that high obliquities have been predicted as a result of perturbations from a wide-orbiting companion, just like the mysterious “third body” in this system. 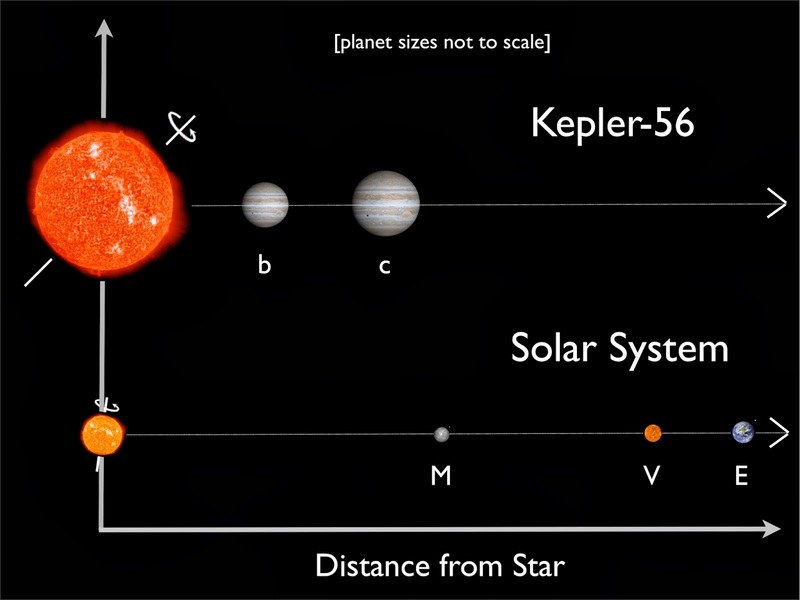 It remains to be seen if systems like this are common, or if Kepler-56 is an oddball. At the very least, this observation is evidence that spin-orbit misalignments – in other words, high obliquities – can occur in more than just single hot-Jupiter systems. *Venus and Uranus are notable exceptions. Venus rotates backwards slowly, and Uranus rotates almost on its side! Both of these are probably due to collisions with massive objects while our Solar System was forming.